Looks like today is another good day to be a Daredevil fan. Not only have the solicits for Daredevil #506 come out, giving us a glimpse of a stunning cover, Daredevil editor Stephen Wacker also gave us a very cool-looking preview – yes, that’s Matt Murdock sans costume – of some interior art by Marco Checchetto from Daredevil #505. If you’re losing count, that’s the first issue from the Left Hand Path arc co-written by Antony Johnston and Andy Diggle which is set to hit the shelves in February. 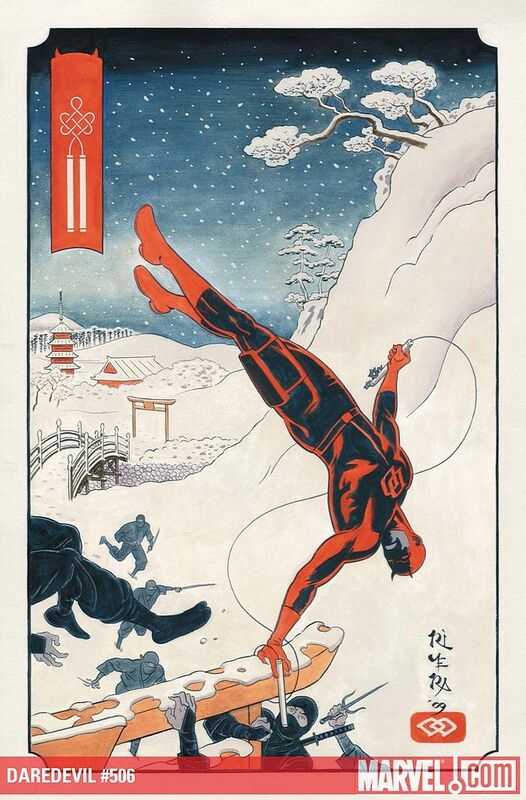 Daredevil #505 will also have a Deadpool variant cover which is currently on display at ManWithoutFear.com. With Daredevil #504 coming out next week, we have some additional preview pages to look forward to in the coming days. If you need a refresher on the slightly erratic shipping schedule, the dates to look forward to are January 27 for Daredevil #504 (the last of the current arc), February 17 for Daredevil #505 and April 7 for Daredevil #506. So, while there is no Daredevil in March, at least we don’t have to wait a full two months for the next issue. That’s good news to me! New interview and preview art in USA Today! I am loving the art on this. @Darediva: For some reason, I was thinking about which side his holster was one too, I don’t usually think about the minor details like that. One of these days, I’m going to have to do a post on the topic of Matt’s handedness simply because it’s one of those things that comes up from time to time but is far from settled. If I’m not mistaken, I think it may have been Gene Colan who started drawing him has left-handed (though I’d have to double-check). Anyway, very very cool art! I love *LOVE* love the cover of #506. I love that Edo-style art. The right hand holsters bug the crud out of me. They were always on the left.